This is a 15" x 23" reprint of 'Bedtime Story' printed in 1988 by Gallery Graphics, Inc. Noel, Missouri (D-287). 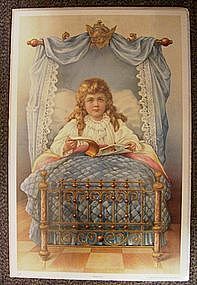 It shows a little girl with long light brown hair and blue eyes sitting in an ornate brass bed with blue satin and lace canopy. 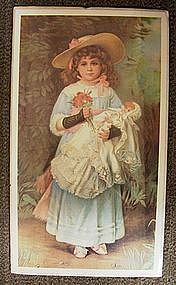 She is wearing a white long-sleeved nightgown and has an open book on her lap. It is sealed in plastic wrap with corrugated cardboard backer. In very good condition and ready for framing. 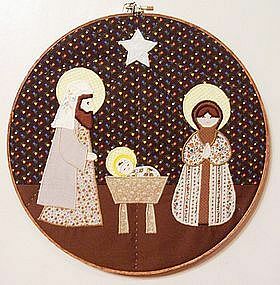 Handmade fabric Nativity scene in a 12" round wood embroidery hoop. This wall hanging is made from print material in shades of brown with highlights of yellow. It is machine appliqued and hand quilted. Cute and unusual. Use USPS link on my home page to calculate priority mail postage from zip code 43570 to your zip code. If other form of shipping of desired, please email with preference. 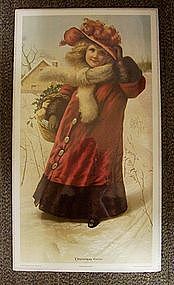 Weight is 1 lb.